You won your case and obtained a Judgement or Order from the Tribunal in your favour. To your dismay, the business refuses to pay you the monies owed. What do you do next? There are two methods in which you can enforce the judgement – 1) writ of seizure and sale; and 2) garnishee proceedings. A writ of seizure and sale is a request by the consumer (Judgment Creditor) for the Court to seize and sell moveable property belonging to the business (Judgment Debtor) to pay the judgment debt should the business fail to pay within the time ordered by the Tribunal and Court. Whether the business is in the process of being wound up, already wound up or bankrupt. For such businesses, consumers should instead approach the Insolvency and Public Trustee’s Office (IPTO) to file a proof of debt against the business. These are some indications that the business may not have assets that are worth seizing. However, where the business is owned by a sole proprietor (as opposed to incorporation under a limited liability structure), the creditworthiness of the individual owner (i.e. the assets of the individual) can also provide an additional route for enforcing your judgment. The same is not applicable where the business is incorporated under a company structure (i.e. limited liability) as generally, shareholders and directors of the company are not personally liable for any debts that the company incur. To apply for a WSS, you must either engage a lawyer or file the necessary documents from one of the two CrimsonLogic Service Bureau located in the Supreme Court or near the State Courts. 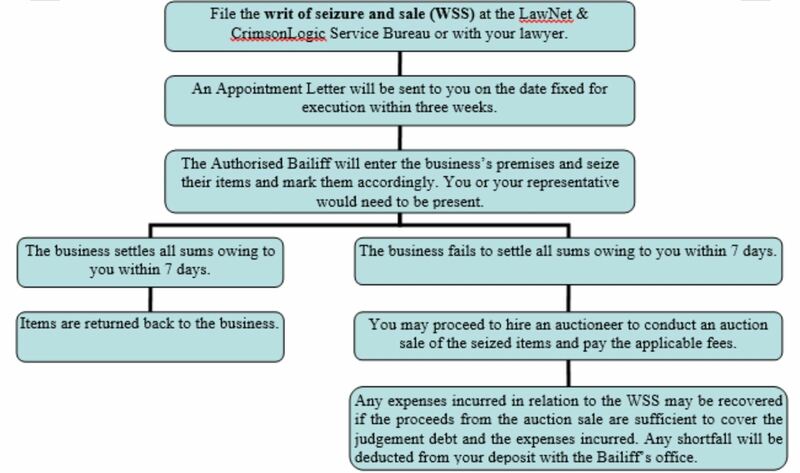 On the day of execution, the bailiff will enter the business’s premise and may seize any items identified by you or your representative by marking them accordingly. If the premises are locked, the bailiff may as its discretion require you to engage the services of a locksmith at your cost. In practice, this is only done at the second attempt of execution. The business then has seven days to settle all sums owing. 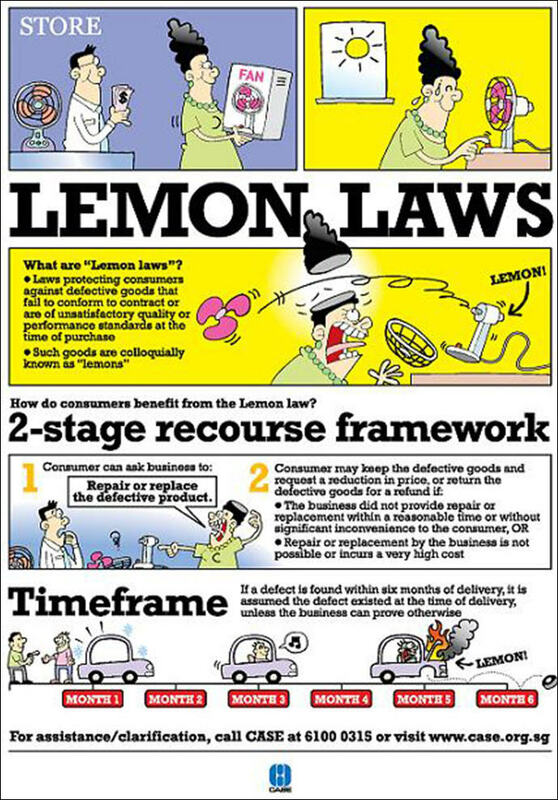 If the business fails to do so, the consumer may proceed with an auction sale of the seized items. Further fees are required to cover the expenses of the auctioneer. A valuation report of all the seized items may also be required. After the entire process, any expenses incurred in relation to the WSS may be recovered if the execution is successful (i.e. the proceeds from the sale of the seized items are sufficient to cover any amounts owing to you and the expenses incurred). Any shortfall however will be deducted from your deposit with the bailiff’s office. There is no guarantee that a WSS will be successfully executed and that you will recover the amount owing to you and the expenses you have incurred in the execution. A garnishee is someone who owes the business (i.e. Judgment Debtor) monies. Where the consumer (i.e. the Judgment Creditor) garnishes the debt, the garnishee must pay money owed to the consumer instead of the business. Broadly, the consumer must first apply for a provisional garnishee order which is to be filed ex-parte (with no other parties involved). Subsequently, at the show cause proceedings, if the garnishee confirms that there are monies due and owing to the Judgment Debtor, the Registrar hearing the matter may make a final garnishee order and the garnishee must pay the consumer instead of the business. There are several instances where a business may be owed monies. One example is where a business has monies in a bank. Under the law, there is a creditor-debtor relationship between the bank and the business (i.e. the business is owed the sum of monies that it had previously deposited in the bank). Consumers however cannot garnish monies contained in an overdraft account as those are monies by the business to the bank. Another example is where the business renders services to another consumer and the consumer agrees to pay in credit terms. Again, a creditor-debtor relationship exists between the parties. Readers are advised to refer to the Singapore State Courts website (https://www.statecourts.gov.sg/) for further details and procedures of the two proceedings above. For further advice or assistance in enforcing your Order or Judgement, please consult a lawyer. SINGAPORE — An unemployed woman who wanted to take advantage of an S$18 promotion to slim down ended up with much lighter pockets instead. She was pressured into signing up for packages worth S$88,000, and wanted to back out after about 30 sessions. With the help of the Consumers Association of Singapore (CASE), the beauty salon and the woman eventually agreed on a cash refund of S$55,000. The case was one of 94 resolved by the consumer watchdog’s mediation centre last year. About three in four cases mediated by CASE last year were resolved, slightly higher than the 68.5 per cent resolution rate in 2013, CASE announced today (June 9). The amount recouped shot up nearly 55 per cent, from S$284,465 in 2013 to S$439,701 last year. The increase in the amount recouped could be because of consumers with contracts of higher values — such as for beauty packages, cars and renovation services — who turn to CASE for mediation, said association president Lim Biow Chuan. The motor-car industry had the highest number of mediated cases last year at 23, or nearly one in five cases seen by CASE’s mediation centre. The beauty industry and contractors accounted for 17 cases each, while real estate cases numbered 12. Other mediation cases involved the slimming, electronics, hair, travel, furniture and computer industries. In 2013, the beauty industry had the highest number of mediated cases, while motor cars ranked fourth. Mr Lim said mediation is more efficient and cost-effective than litigation. CASE’s mediation centre was set up in 1999 to resolve disputes between consumers and businesses, and he said the association’s mediation sessions are conducted with two professional mediators. The settlement is binding. CASE hopes to raise awareness of mediation through talks and seminars. Last May, the watchdog and the Personal Data Protection Commission signed an agreement for CASE’s mediation centre to help settle disputes between organisations and consumers related to data protection provisions under the Personal Data Protection Act. So far, no case of this nature has been brought for mediation. The practice of adopting never-ending sales as a means to lure consumers is indeed an unfair practice ("Tackle errant advertising of the never-ending sale" by Mr Tan Chak Lim; Tuesday). 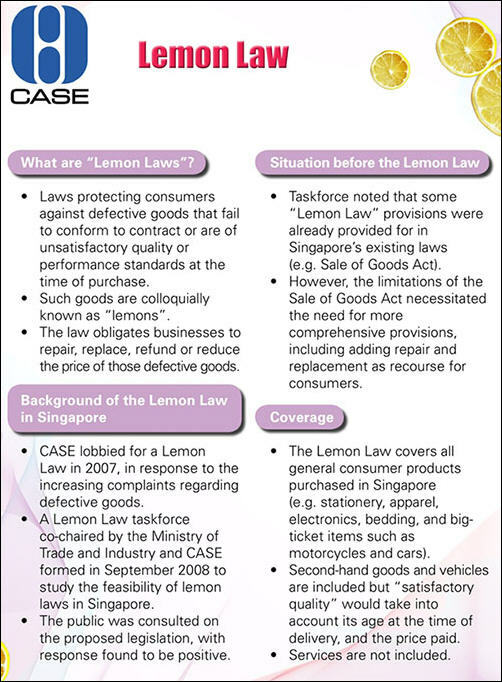 Under the Singapore Code of Advertising Practice, all advertisements should be legal, decent, honest and truthful. The Consumer Protection (Fair Trading) Act also states that retailers should not make false claims that goods are available at a discount for a stated period when it is not true. 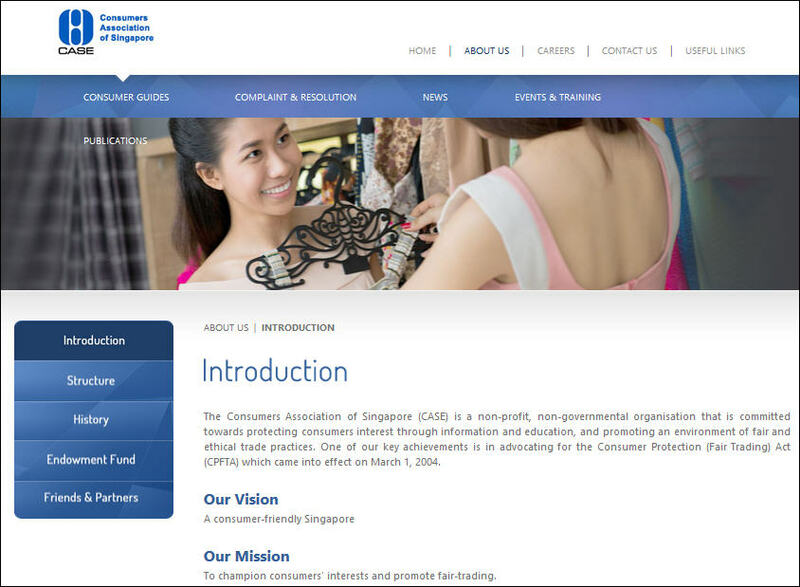 If consumers encounter any false claims or advertisements that there are sale items being sold at a discount when this is untrue, they can give their feedback directly to the Advertising Standards Authority of Singapore (Asas) on the misleading advertisement, or to the Consumers Association of Singapore (Case) if they have bought an item from the retailer. We will monitor such complaints and highlight them to the Ministry of Trade and Industry, if deemed necessary. We encourage Mr Tan to approach either Case or Asas to give us the details of the misleading advertisement or the specific shop.